For the film, see Parts: The Clonus Horror. Look up clonus in Wiktionary, the free dictionary. Clonus (from the Greek for "violent, confused motion") is a series of involuntary, rhythmic, muscular contractions and relaxations. Clonus is a sign of certain neurological conditions, particularly associated with upper motor neuron lesions involving descending motor pathways, and in many cases is, accompanied by spasticity (another form of hyperexcitability). 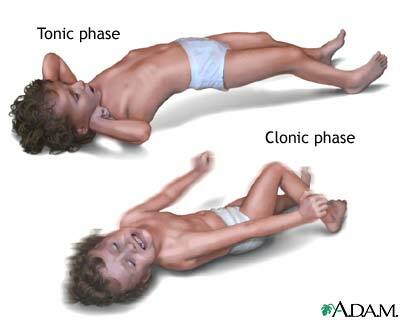 Unlike small, spontaneous twitches known as fasciculations (usually caused by lower motor neuron pathology), clonus causes large motions that are usually initiated by a reflex. Studies have shown clonus beat frequency to range from 3–8 Hz on average, and may last a few seconds to several minutes depending on the patient’s condition. Clonus is typically seen in patients with stroke, multiple sclerosis, spinal cord damage and hepatic encephalopathy. Clonus has also appeared after ingesting potent serotonergic drugs, where ingestion strongly predicts imminent serotonin toxicity (serotonin syndrome). The self re-excitation of hyperactive stretch reflexes theory involves a repetitive contract- relax cycle in the affected muscle, which creates oscillatory movements in the affected limb. In order for self re-excitation to exist, both an increase in motor neuron excitability and nerve signal delay are required. Increased motor neuron excitability is likely accomplished by alterations to the net inhibition of neurons occurring as a result of injury to the CNS (stroke/ spinal cord injury). This lack of inhibition biases neurons to a net excitatory state, therefore increasing total signal conduction. Signaling delay is present due to an increased nerve conduction time. Long delays are primarily due to long reflex pathways, which are common in distal joints and muscles. This may therefore explain why clonus is typically found in distal structures like the ankle. Frequency of clonus beats have been found to be directly proportional to the length of the reflex pathway it is found in. Clonus, with respect to the presence of a central oscillator, functions on the theory that when the central oscillator is turned on by a peripheral event, it will continue to rhythmically excite motor neurons; therefore creating clonus. Although the two proposed mechanisms are very different in [theory] and are still debated, some studies now propose the potential of both mechanisms co-existing to create clonus. It is thought that the stretch reflex pathway may be stimulated first, and through its events, cause a decreased synaptic current threshold. This decreased synaptic current threshold would enhance motor neuron excitability as nerve impulses would be more readily conducted, and thus turn on this central oscillator. This theory is still being investigated. Clonus tends to co-exist with spasticity in many cases of stroke and spinal cord injury likely due to their common physiological origins. Some consider clonus as simply an extended outcome of spasticity. Although closely linked, clonus is not seen in all patients with spasticity. Clonus tends to not be present with spasticity in patients with significantly increased muscle tone, as the muscles are constantly active and therefore not engaging in the characteristic on/off cycle of clonus. Clonus results due to an increased motor neuron excitation (decreased action potential threshold) and is common in muscles with long conduction delays, such as the long reflex tracts found in distal muscle groups. Clonus is commonly seen in the ankle but may exist in other distal structures as well. Clonus at the ankle is tested by rapidly flexing the foot into dorsiflexion (upward), inducing a stretch to the gastrocnemius muscle. Subsequent beating of the foot will result, however only a sustained clonus (5 beats or more) is considered abnormal. Clonus can also be tested in the knees by rapidly pushing the patella (knee cap), towards the toes. ^ a b c d e f g h i j k l m n o p q r s t u v w Hilder, Joseph M.; Zev W. Rymer (September). "A Stimulation Study of Reflex Instability in Spasticity: Origins of Clonus". IEEE Transactions on Rehabilitation Engineering 7 (3): 327–340. Retrieved May 6, 2012. ^ a b c d e ">Douglas, Wallace M.; Bruce H Ross, Christine K. Thomas (Aug 25). "Motor unit behaviour during clonus". Journal of Applied Physiology 99 (6): 2166–2172. Retrieved May 6, 2012. ^ a b c Weisenburg, Theodore H (November). "Triceps, Biceps and Finger Clonus". Journal of Nervous and Mental Diseases 30 (11): 681–683. Retrieved May 6, 2012. ^ Mitchell, John K. (May). "Two unusual forms of clonus: toe clonus and lateral ankle clonus". Journal of Nervous and Mental Disease 29 (5): 260–261. Retrieved May 6, 2012. 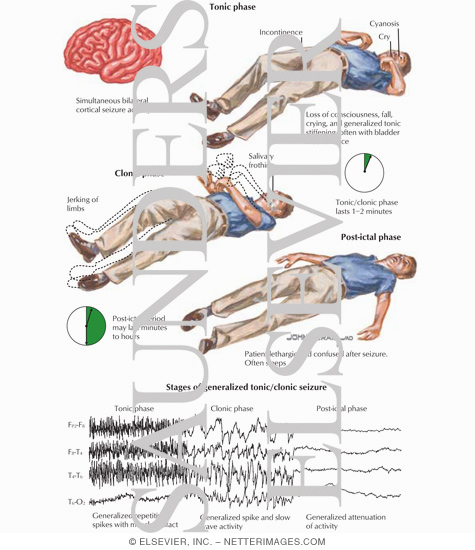 Increased cerebral oxygenation precedes generalized tonic clonic seizures. Moseley BD1, Britton JW2, So E3. Epilepsy research.Epilepsy Res.2014 Nov;108(9):1671-4. doi: 10.1016/j.eplepsyres.2014.09.017. Epub 2014 Sep 22. Medication side effects among people with epilepsy taking phenobarbital in Zambia. Elafros MA1, Bui E2, Birbeck GL3. Epilepsy research.Epilepsy Res.2014 Nov;108(9):1680-4. doi: 10.1016/j.eplepsyres.2014.08.005. Epub 2014 Aug 30. Epilepsy in Menkes disease: An electroclinical long-term study of 28 patients. Verrotti A1, Cusmai R2, Darra F3, Martelli P4, Accorsi P4, Bergamo S5, Bevivino E2, Coppola G6, Freri E7, Grosso S8, Matricardi S7, Parisi P9, Sartori S5, Spalice A10, Specchio N2, Carelli A11, Zini D3, Bernardina BD3, Giordano L4. Epilepsy research.Epilepsy Res.2014 Nov;108(9):1597-603. doi: 10.1016/j.eplepsyres.2014.08.006. Epub 2014 Aug 30. Official site with biography, schedule, pictures, audio samples, press and street team.